The first half saw Longridge having lots of possession but with little penetration to trouble Garstang keeper Dan Curwen. Garstang looked the more dangerous side on the counter-attack and could have taken the lead when Alan Coar collected Tom Graham’s pass and plyed the ball to Jonny Hothersall, whose close-range shot was blocked. At the other end, Curwen smartly gathered a Lee Ashcroft free-kick but, other than that, he was only called into action dealing with crosses. Coar was also thwarted by a last-gasp challenge, Kieran O’Connor headed just over from Tom Entwisle’s corner and Hothersall shot wide. Another Coar header went just over before he was denied by the bar when heading Entwisle’s corner at goal as the first half ended goalless. 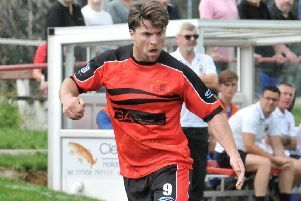 The deadlock was broken two minutes into the second half when Alex Murphy’s shot hit Dan Birch on the arm. The referee awarded a penalty from which Lee Ashcroft gave Curwen no chance. Garstang replied by bringing on Ryan Dodd, which proved the catalyst for their comeback. The large travelling support was rewarded with an equaliser when Graham’s exquisite cross found the dangerous Coar. His header was brilliantly pushed on to the bar by the keeper but Dodd reacted faster than anyone as he stroked the rebound home. Dodd was finding space between the Longridge midfield and back four and, having picked up the ball in space, Dodd found Coar who calmly pulled the ball back for Hothersall to fire home from close range and Garstang the lead for the first time. Garstang were able to see out the remainder of the game with Longridge starting to go longer. Curwen coped with the crosses which started to come into the box with the help of O’Connor and Gaz Fawcett. The last few minutes were tetchy as Garstang won a succession of corners and wound down the clock, much to the frustration of the home side.